Every year, the list of names of trans people murdered across the globe grows. This is a sobering statistic and one that helps fuel the work of Dr. Alex Abramovich, who received an Advocacy Award from York Regional Police in Aurora last week for his ground-breaking work and fight for policy reform for 2SLGBTQ+ youth homelessness. Presented last Tuesday on the Transgender Day of Remembrance, one didn’t have to look far for evidence of this sad stat. 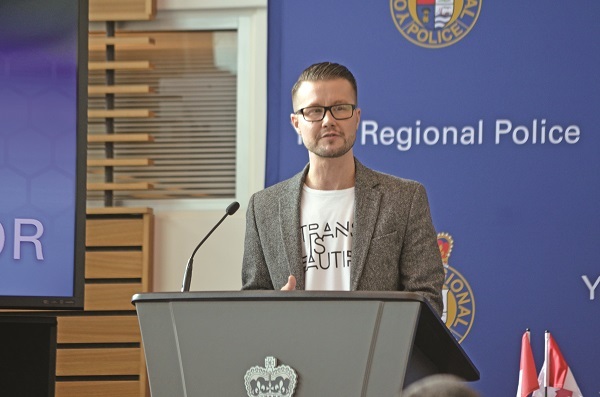 At last year’s ceremony to mark the occasion, the York Regional Police (YRP), welcomed a speaker who spoke about her own very personal experiences. Less than 12 months later, this advocate for the Trans community took her own life. Underscoring the importance of Dr. Abramovich’s work was Benjamin Debbert. A resident of Durham Region, Benjamin shared a very personal experience of being a homeless youth after coming out to their family as transgender. After beginning counselling, Benjamin was in a shelter. While some people find the shelter experience particularly challenging, they said it was “amazing” and, through the experience, they met some of their best friends. “I was homeless, that is not fun. I didn’t have a job, but I had finally people who supported me and that was huge,” said Benjamin, who is now a childcare worker for the Boys & Girls Clubs of Durham Region. “I still talk to the shelter people and that was three years ago. They helped me through my toughest times and I don’t know where I would be without them. Flash forward to now, I live with my roommate. I have three cats because I am crazy. I have an amazing job. I never thought working with kids was going to happen for me once I came out because not only is it so different working with kids when you’re female as opposed to male. I find that males who go into child care are less likely to get hired because they are male and because people think it is creepy when it is not, but also the fact I am trans.